New generation pop stars have been advised to always seek permission before sampling decades old work of arts that were done by older artistes. 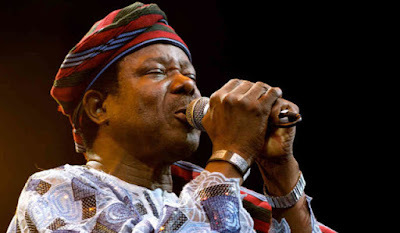 This was the submission of juju icon King Sunny Ade’s manager, Clement Ige who was speaking at Goldberg’s Ariya Repete Roundtable Discourse in Abeokuta. Ige, who has worked with KSA for nearly forty years and is also an Executive Director at Culture FM, Ondo identified a number of issues wiht the new generation artistes that have become a menace threatening the growth of traditional Yoruba music. He also added. “Many of them don’t give credit to the original composer of the song they adopt. They just sing it without seeking permission. That’s a copyright infringement. It’s not done in developed societies. Till today Small Doctor didn’t get our permission before and after singing “ijó tí m’ojó l’àná, tí wọn n’pariwo, oni nkọ, ola nkọ”. And many of them are guilty of this. The Davido that used Sunny’s lyrics in his song didn’t even get it right and that’s because he didn’t ask for permission; if he did we would have corrected him. The panel was to discuss the evolution of Yoruba traditional music and its influence on modern pop music and it featured musicians such as K1 De Ultimate, Sir Shina Peters, Lekan Babalola and a host of others. It is a precursor to the annual Ariya Repete talent hunt that seeks to find out young talents in the Fuji and Juju genres. Auditions for talents on March 13 in Ado-Ekiti, Sango Ota and other places across eight cities in Nigeria.